Heat oven to 375°F. Spray 8 regular-size muffin cups with cooking spray. Set icing aside. Separate dough into 8 rolls. Press into and up sides of muffin cups. Spoon 2 generous tablespoons pie filling into each dough-lined cup. Bake 14 to 18 minutes or until golden brown; cool in pan 5 minutes. Transfer icing to small microwavable bowl. Microwave uncovered on Low (10%) 8 to 10 seconds or until thin enough to drizzle. Place rolls on serving plate; spoon icing over rolls. Serve warm. 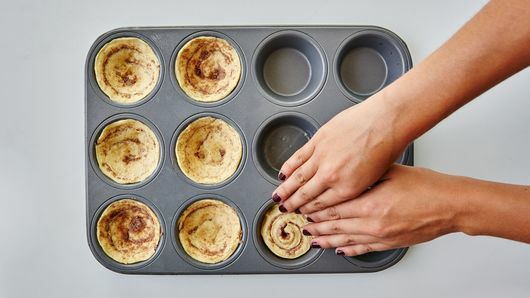 Use a nonstick muffin pan for easiest removal. Use leftover apple pie filling as a topping over vanilla ice cream. We did it. We made personal apple pies that only require two (yes, two!) ingredients! Introducing: apple pie with cinnamon roll crust! 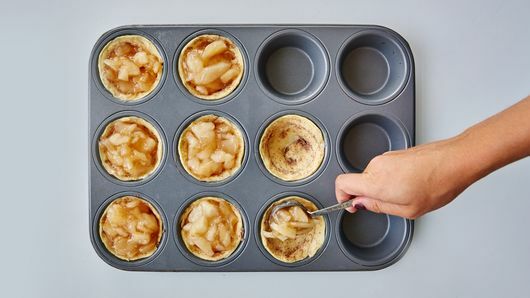 Prep for this recipe only takes 10 minutes—simply press cinnamon rolls into a muffin pan and scoop some apple pie filling into each cup and bake. Don’t forget that cinnamon roll frosting drizzle at the end! This recipe is a huge hit with our fans because of its ease, but also its versatility. Pillsbury fans have tried changing up the filling and making mini peach pies, cherry pies and blueberry pies. Try this apple one first, and then let us know if you experiment! 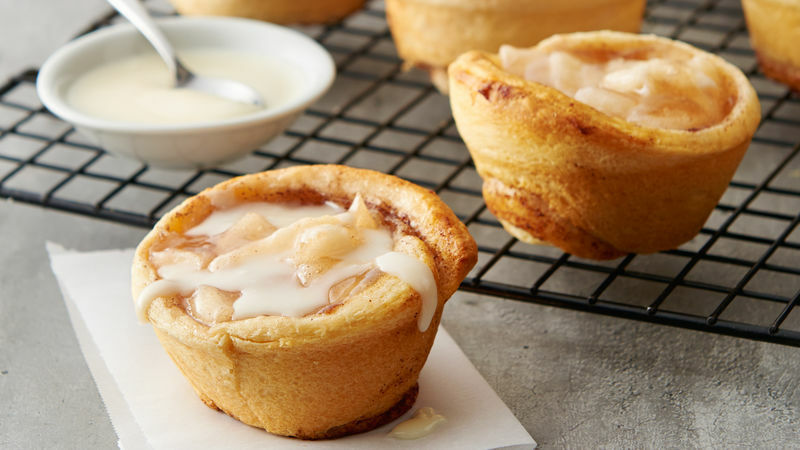 Based on user feedback, we tested Cherry-Almond Pie Cups in our kitchens, and the results did not disappoint. Have a little more time on your hands and want to make traditional apple pie with pie crust? We have a how-to article for you to read that will help you make the best apple pie of your life. Diggin’ the apple pie twists? We have recipes for that, too!